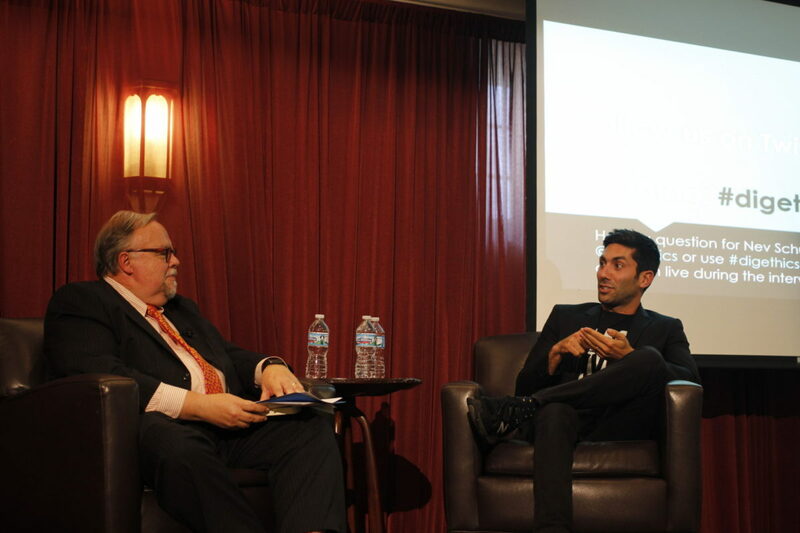 Noah Johnsen Nev Schulman sat down with the dean of the School of Communication, Don Heider, to talk about the ethical implications of his MTV show "Catfish." Nev Schulman is a man of many titles: producer, photographer, author, husband and father, to name a few. He’s most well-known as the the host and producer of MTV’s “Catfish: The TV Show,” a reality show focused on online couples meeting in real life, often revealing themselves to be entirely different people from their online personas. Schulman has taken on an additional role since gaining fame through MTV — he’s spoken at several universities across the country to discuss topics including relationships and success. Loyola featured Schulman in a different capacity, picking his brain on ethical conundrums at the annual International Symposium on Digital Ethics on Oct. 13. Despite all the accomplishments under Schulman’s belt, he sat down with The PHOENIX and said he feels he can do more. Still, at 33, Schulman has accomplished more than some do in a lifetime. He’s written a book, “In Real Life: Love, Lies and Identity in the Digital Age,” and is part of a Facebook Watch show through media site ATTN: called “We Need to Talk,” in which he discusses relationships with his wife, Laura Perlongo. His more popular show, “Catfish,” just wrapped its sixth season — a testament to the connection people feel to the show. Schulman said when he filmed the show’s pilot episode, he thought the premise of watching him and co-host and cameraman Max Joseph talking to people on a couch about their online romances was boring. 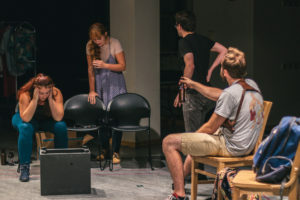 Instead, the show was a success, a consequence of the weekly mystery of the real identity of the “catfish” — the titular term for someone who lies about their identity online. Years later, Schulman credits the show’s longevity to its ability to give viewers the chance to live vicariously through the people being catfished. Schulman finds his work on “Catfish” to be especially important to younger people, as it starts conversations they might not otherwise have. He said sometimes, when he worries about exploiting people in emotional situations, his producer often reminds him of the importance of the show. Schulman said the biggest takeaway he’s gained from the show is the power of listening — something he said his recently passed grandfather was known for. Schulman said he hopes to improve his listening in his own life, apart from the role he takes on the show. Schulman described the double-edged sword of the internet and social media. While it’s great for meeting people from different communities, he said, the internet can be a source of negativity, such as its use by President Donald Trump. This progressive mindset is apparent even in Schulman’s style of dress. He wore a shirt reading “Black Lives Matter” during his PHOENIX interview and often tweets about issues ranging from breaking gender stereotypes to supporting women’s rights. When it comes to leaving his own legacy, Schulman said he wants to be a leader in advocating for social causes. “Catfish: The TV Show” airs on Wednesdays on MTV at 9 p.m.
Julie Whitehair is the editor-in-chief of The PHOENIX and a senior journalism student from Calumet City, Illinois. She hopes to combine her curiosity and love of words to continue reporting and storytelling after graduation.